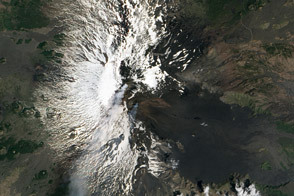 Throughout 2011, activity at Sicily’s Mount Etna has been characterized by paroxysms: short, violent bursts of activity. Each event has included volcanic tremors, ash emissions, and lava flows centered around the New Southeast Crater, just below the summit. 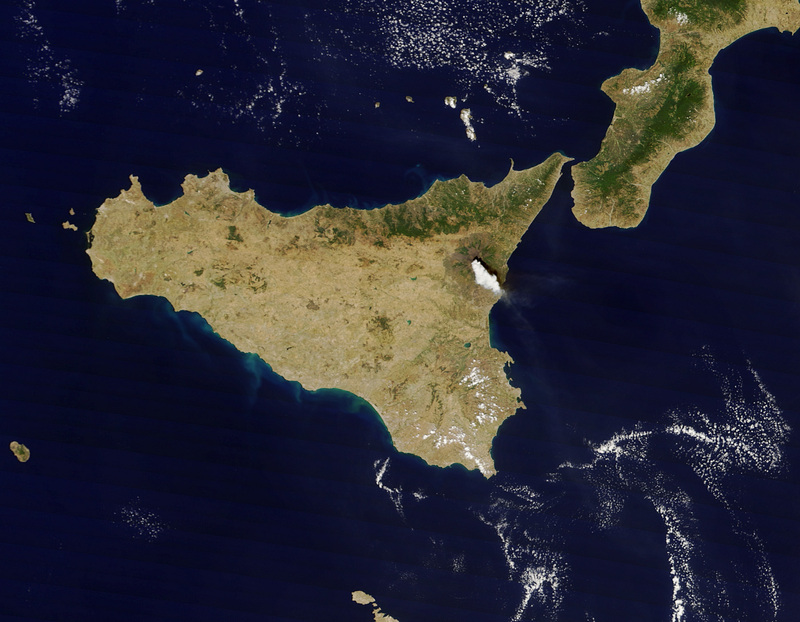 On August 12, 2011, Etna had its tenth paroxysm of the year, captured in this natural-color satellite image. 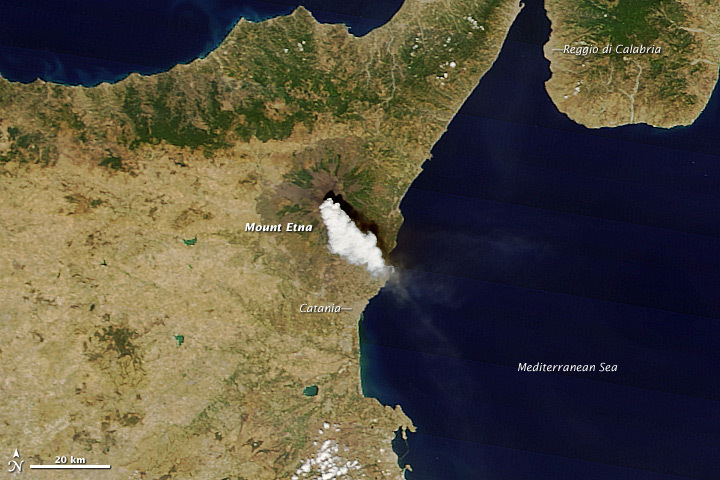 Etna spewed a thick white plume of gas and ash to the southeast, towards the nearby city of Catania. The ash cloud was produced by vigorous lava fountaining at the New Southeast Crater. 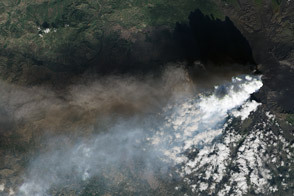 The Toulouse Volcanic Ash Advisory Center estimated ash emissions reached an altitude of 14,000 feet (4,300 meters); 2,000 feet (600 meters) above the 10,925-foot (3,330-meter) summit. The image was captured at 11:40 a.m. local time by the Moderate Resolution Imaging Spectroradiometer (MODIS) aboard the Terra satellite. Boris Behncke, a volcanolgist from the Istituto Nazionale Di Geofisica E Vulcanologia in Catania, Sciliy, provides updates on Etna’s activity on his Twitter feed, @etnaboris. NASA image courtesy Jeff Schmaltz MODIS Rapid Response Team, NASA-GSFC. Caption by Robert Simmon. On August 12, 2011, Etna had its tenth paroxysm of the year, spewing a thick white plume of gas and ash into the air. Mount Etna continues to experience the occasional paroxysm. Klemetti, Erik. (2011, August 12). GVP Weekly Volcanic Activity Report for August 3–9, 2011: Cleveland’s Dome, Indonesian Volcanoes and a Busy Etna. Accessed August 12, 2011. Toulouse VAAC. (2011, August 12). Volcanic Ash Advisory. Accessed August 12, 2011.